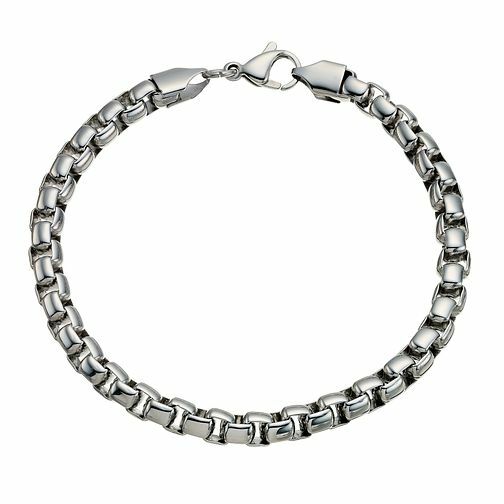 Go for simple and sophisticated everyday style, with this sleek stainless steel chain bracelet crafted with a lobster clasp. Perfect for layering with other bracelets for a fashion forward look. Stainless Steel Chain Bracelet is rated 4.1 out of 5 by 8. Rated 4 out of 5 by Anonymous from This product is almost perfect The design of the product is brilliant. My only issue is that it was a gift and the clip is hard to use especially if a person has big hands. Rated 5 out of 5 by Anonymous from Nice gift! Cute gift for Christmas! My boyfriend has a chain very similar so this matches very nicely.